Quality, food safety, traceability and durability. That is what we stand for! Thanks to this excellent result and the high degree of alignment to the FSA, Unilever has referenced Vegaplan as fully compliant with the principles of Sustainable Agriculture. The benchmark has been conducted for arable crops, including sugar beet, potatoes, chicory, grains and vegetables destined for processing. Learn more about the Vegaplan scheme and download our new English brochure. 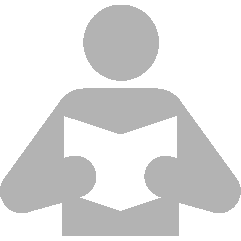 It is specially designed for international users and gives an overview on scope and content of Standard. We wish you a pleasant reading ! Vegaplan has scored ‘silver’ in the benchmark with SAI for arable crops, whereof sugar beet, potatoes, chicory, grains and vegetables for the industry. 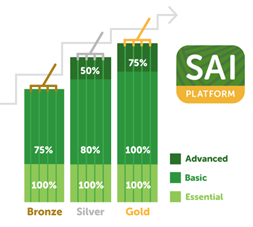 SAI stands for Sustainable Agriculture Initiative and was set up in 2002 by Nestlé, Unilever and Danone. SAI counts today 80 members of the food and drink industry and developed the Farm Sustainability Assessment tool (FSA 2.0), which is an instrument to assess the sustainable development of a farm. This FSA tool is a wide set of 112 complex questions about environmental, social and economic aspects of a farm. The benchmark is based on this tool. Vegaplan covers 100% of the essential, 94% of the basic and 77% of the advanced requirements. This excellent result would not have been possible without the integration of all IPM measures and sustainability requirements in Vegaplan in 2014. 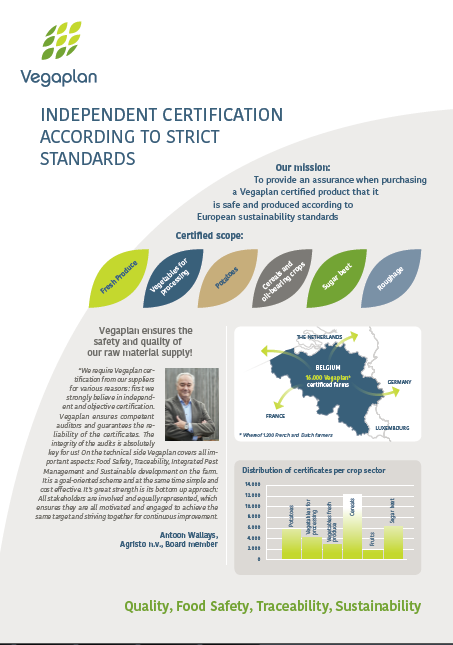 For some FSA requirements that are deliberately not covered by the Vegaplan Standard because they are inspected by the authorities or via other structures, the Belgian legislation has been taken into account in the benchmark. Examples are labor conditions like a living wage for workers, health insurance, prohibition of child work and forcedlabor. Wat is the benefit of this benchmark for the farmer? We avoid extra inspections based on the FSA-tool in Belgium. Through this benchmark we can show to the international food industry and distribution – who do not necessarily know details of the Vegaplan Standard – that our standard and thus the certified farmer comply with their expectations relates to sustainability. This exercise brings Vegaplan on an international level and show the efforts made towards sustainable development. And the buyers of agricultural produce are able to confirm to their clients that their choice for Vegaplan certified crops is the right choice! 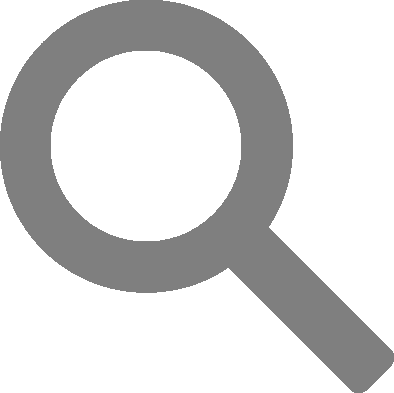 The portal site for everything related to certification of Belgian agricultural products!